Thomas Keller is an American culinary superstar. He's executive chef of Bouchon and Per Se in New York and French Laundry and Ad Hoc in California. He's also penned several cookbooks. The latest, "Ad Hoc At Home," has been on The New York Times best-sellers list for six weeks. The user-friendly book focuses on bringing gourmet flavors to classic American cooking. Keller shared some secrets to gourmet American cooking, on "The Early Show." Beef stroganoff made with Campbell's cream of mushroom soup was a mainstay of the 1970s that I still feel some nostalgia for. This interpretation of that all-American version of stroganoff calls for braised beef short ribs with a mushroom cream sauce, enriched with crème fraîche. This is just as much about the mushrooms as it is the beef. Some of the cremini are pureed to use in the sauce, and some are sliced and sautéed to toss with the noodles. Working in a couple of batches, process the mushrooms for the sauce in a food processor, scraping down the sides as necessary, until ﬁnely chopped. Transfer to a bowl. Melt the butter in a medium saucepan over medium heat. Add the onion and cook until translucent, about 5 minutes. Season with salt and pepper. Add the chopped mushrooms, increase the heat to medium- high, and cook, stirring occasionally, until all the liquid has evaporated, 10 to 15 minutes. Pour in the cream, add the sachet, and bring to a boil. Reduce the heat to keep the cream at a simmer and simmer for about 35 minutes, until the cream is reduced by about one-third and infused with the mushroom ﬂavor. Meanwhile, set a cooling rack over a baking sheet and line the rack with paper towels. Heat a large frying pan over medium heat. Add 2 tablespoons of the butter and 1 tablespoon of the canola oil and heat until the butter melts. Add half of the mushrooms, season with salt and pepper, and cook, without stirring (if you toss or move the mushrooms too early, they will steam rather than brown), for about 3 minutes, until the ﬁrst side is golden brown. Turn the mushrooms and cook for another minute or two, until golden brown. Transfer to the lined baking sheet to drain and cook the remaining mushrooms in the remaining 2 tablespoons butter and 1 tablespoon oil. It is easiest to cut the short ribs into pieces while the meat is cold. Cut into 2-inch cubes and let sit at room temperature for 30 minutes. When the sauce is ready, discard the sachet, pour the sauce into a blender, and blend until smooth. Strain the sauce into a medium saucepan, set over medium-low heat, and stir in the crème fraîche until incorporated. Reserve about 1/4 cup of the sautéed mushrooms, and add the remaining mushrooms to the sauce. Season to taste with salt and pepper. The sauce will be on the thick side. Keep warm on the back of the stovetop or on a diffuser over very low heat. Preheat the oven to 350°F. Set a cooling rack over a baking sheet. Bring a large pot of salted water to a boil for the pasta. Meanwhile, heat some oil in an ovenproof frying pan over medium- high heat. When the oil is hot, add the meat, presentation (nicest) side down, and brown for 2 to 3 minutes, until richly caramelized. Turn the meat over, transfer to the oven, and heat through, about 10 minutes. Add the pappardelle to the boiling water and cook until al dente, about 2 to 4 minutes if fresh. Reserve a cup of the cooking water, and drain the pasta. Transfer to a large bowl and toss with the butter. Meanwhile, if necessary, reheat the cream sauce over low heat. Reheat the reserved sautéed mushrooms in a small pan. Toss the noodles with the cream sauce. If the sauce seems too thick, add a bit of the reserved cooking water to thin. (The cooking water will have some starch in it from the pasta and will maintain the silkiness of the sauce while thinning it.) Add half of the sautéed mushrooms to the noodles and arrange them on a platter. 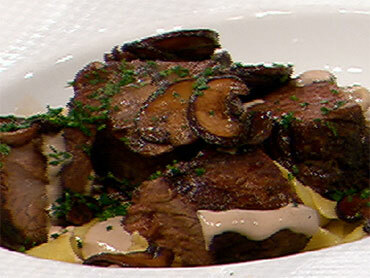 Arrange the short ribs and the remaining mushrooms on the top. Sprinkle with gray salt and garnish with parsley. Braising is such a satisfying process for the cook. First, you brown the ribs in fat, then cook them in a rich braising liquid-until they're tender but still have some body to them, not until they're falling apart-then cool them in the braising liquid. The flavor improves with time, so these are actually best cooked at least a day before you plan to serve them. Combine all the ingredients for the red wine reduction in a large Dutch oven or other heavy ovenproof pot that will hold the meat comfortably. Bring to a simmer over high heat and reduce the heat to maintain the simmer for 45 to 50 minutes, until the wine has reduced to a glaze. Meanwhile, trim any pieces of sinew from the top of the short ribs; leave the layer of fat and silverskin. Remove any remaining connective tissue from where the bones were removed. Season all sides of the meat generously with salt and pepper and coat in ﬂ our, patting off any excess. Heat some canola oil in a large sauté pan over high heat until it shimmers. Add the meat fat-side-down, reduce the heat, and brown the meat for 3 minutes. Turn the meat and brown the other side. Transfer the meat to a tray. Preheat the oven to 350°F. Add the onion, carrots, leeks, garlic, thyme, and bay leaves to the wine reduction and toss together. Cut a piece of cheesecloth about 4 inches larger than the diameter of the pot. Moisten the cheesecloth and wring dry, place over the vegetables, and fold over the edges to form a "nest" for the meat. (The cheesecloth will allow the liquid to ﬂavor and cook the meat but prevent bits of vegetable and herbs from clinging to it.) Put the meat on the cheesecloth and add the stock; it should come just to the top of the meat. Cut a parchment lid and place it over the meat. Transfer the pot to the oven, reduce the heat to 325°F, and braise the beef for 11/2 to 2 hours, until very tender. To check, uncover the meat and press on it: the ﬁbers should separate as you press down, but the meat shouldn't be falling apart. Transfer the meat to a heatproof container. Strain the braising liquid twice through a ﬁ e-mesh conical strainer into a bowl, then strain into a fat separator or deep bowl and allow the fat to rise to the top. Skim off the fat and strain the liquid over the meat. (The meat can be refrigerated in the liquid for up to 3 days, then ﬁnished as follows. Or it can be used to make Beef Stroganoff or Catalan Beef Stew.) To get ready to serve, preheat the oven to 400°F. Remove any solidiﬁed fat from the surface of the liquid. (If the liquid has gelled, place the container in the oven or microwave and heat until the liquid melts and you can remove the meat without breaking it.) Put the meat fat-side-down in an ovenproof sauté pan and pour in about 1/2 inch of the braising liquid. Pour the remaining liquid into a saucepan, bring to a simmer, and simmer until reduced to a sauce consistency. Remove the sauce from the heat. Meanwhile, put the pan of short ribs over medium heat and bring to a simmer, spooning the juices over the meat. Transfer the uncovered pan to the oven to heat through, about 15 minutes, basting with the juices once or twice. Turn the meat over and baste generously with the juices. Return to the oven for another 5 minutes or so, basting two more times, until the meat is hot and richly browned with the sauce. Cut the short ribs against the grain into slices about 1/2 inch thick. Keep checking the meat as you slice, as the grain will not follow a straight line, and adjust your knife to keep cutting against the grain. Arrange the meat on a platter and spoon the sauce over it. Sachets are used to flavor cooking liquids. A cheesecloth sachet encloses small herbs and spices such as peppercorns and cloves, and works like a tea bag. Once the contents have added their flavors to the cooking liquid, the sachet can easily be removed and discarded. Pasta dough is such an elementary and satisfying process with so many applications that I always try to encourage people to make it at home. You can't achieve the same effects with store-bought fresh pasta, and it's a completely different product from dried pasta. It's also a wonderful way to get kids into the kitchen and cooking. This is a very rich egg-yolk pasta. Try to find Tipo 00 fl our, the "00" designating a finely ground fl our; it's usually available in Italian markets and results in a pasta with a soft silky texture. Mound 21/2 cups of the ﬂour on a board. Create a well about 8 inches across in the center by pushing the ﬂ our out from the center, leaving some ﬂour at the bottom of the well. Pour the egg, yolks, olive oil, and milk into the well. Using a fork, mix the ingredients together in the well. Then, little by little, begin to bring in some of the ﬂ our from the sides of the well. Continue to bring in the ﬂour until all of it is incorporated and the mixture has a paste- like texture. Using a dough scraper, starting at the outermost part of the well, make chops across from left to right and then top to bottom. Then use the dough scraper to lift the dough from the board and fold it over itself until it completely comes together. TO ROLL THE PASTA: Line a baking sheet with parchment paper. Cut the dough into thirds. Work with one piece at a time, keeping the other pieces covered so the exterior does not dry out. Shape one piece of dough into a rectangle about 1/2 inch thick. Fold it into thirds, as if you were folding a business letter. Set the rollers of the pasta machine at the widest setting and dust the rollers with ﬂour. Roll the dough through the machine, and then run it through the same setting again. Repeat this procedure three or four more times, but the last time, fold the pasta sheet lengthwise in half to give you a narrower piece of pasta and run it through the machine. Lower the setting one notch and roll the dough through. Do not fold it over. Continue the process until the sheet of pasta is quite thin (there may be a recommended setting for your machine; if not, the second-to- the last setting is usually best); sprinkle the dough lightly with the ﬂ our if it feels at all sticky or tacky. When the sheet becomes too long to work with, cut it in half, ﬂ our lightly, and continue to roll both pieces. Lay the dough on a ﬂoured surface, cover, and let it rest for a few minutes, then roll through the machine again. The pasta will be very thin. Loosely roll up the dough and cut into 1- to 1G-inch-wide strips. Spread the pappardelle on the prepared baking sheet and cover with another piece of parchment paper. Repeat with the remaining 2 pieces of dough. The pasta can be covered tightly with plastic wrap and refrigerated for up to 2 days. A surprising amount of finesse goes into making a great salad. You have to know when to salt it, how to dress it, when to pepper it. What's appropriate as ingredients? Are the greens bright and fresh? Is the dressing balanced in flavor, the garnish vivid? If you can put your fork into any part of the salad and have in that one forkful all its components-some piquillo pepper, pickled carrot, red onion, and greens, say-that's an important quality. Is every leaf evenly dressed? Are the fresh herbs strewn throughout? These are some of the things that define a great salad. Our method follows just a few rules. We season all the components separately and then bring them together-meaning that if we're making a Cobb salad, all the ingredients, from the avocado to the tomatoes, are seasoned separately with salt. When we're ready to mix the salad, we place the leaves in a shallow bowl, drizzle the oil or vinaigrette around the sides of the bowl, and then toss the leaves gently. Oiling the bowl, rather than pouring the oil directly on the greens, ensures that all the greens pick up the same amount of oil when you toss them. We then salt the greens and toss again. We may dress the greens with something acidic, or we may serve a dressing on the side, depending on how delicate the greens are. The leaves are often so delicious that we want to feature them and serve them simply with salt and olive oil, and perhaps a little vinaigrette on the side. The final step in building a salad is to finish it with fresh herbs, either whole leaves or torn: mint, basil, chervil, tarragon. The only herbs we cut are chives. I find you lose too much flavor on the cutting board when you chop herbs. And that's it-all very simple, but each step is important. Below are the key steps in a nutshell, followed by suggestions for interesting combinations. For a mixed green salad, select the greens, just one type or a combination, and other components that will complement them. Figure on about 2 cups of greens per person. Remove limp or bruised leaves and trim the greens of any dark spots. Wash the greens with cold water. If they are very dirty, wash them twice, place them in a bowl of cold water and let stand briefly, then lift the greens from the water. (If you drain the greens and water into a colander, you will be reintroducing any dirt that's fallen to the bottom of the bowl.) Spin the greens in a salad spinner to dry them thoroughly. Put the greens in a wide bowl. Pour the oil or dressing around the sides of the bowl, rather than directly on the greens. Lift and toss the greens so the oil or dressing lightly coats them. If we use a dressing on the greens, rather than just oil, we add it sparingly and serve more dressing on the side. Sprinkle the greens with salt and freshly ground pepper and toss. For multicomponent salads, choose a shallow serving platter, so that you can layer the additional ingredients and intersperse them with the greens, both creating a beautiful presentation and making it easy for everyone to sample all the ingredients in the salad. As you layer the ingredients, think about their weight, and save lighter, more delicate ingredients for the top. Here is another slightly quirky entry from the American tradition, pineapple upside-down cake. I have some affection for canned pineapple for nostalgic reasons, but we use fresh pineapple here for a more elegant dessert. Again, think of this as a general template that you can use for different fruits, and they all work wonderfully. We make what we call a "pan schmear" of butter and brown sugar, top it with the fruit, and pour the cake batter over the top. The recipe makes more schmear than you need, but it is diffi cult to make less. It will keep for a couple of weeks in the refrigerator, ready when you want to make another cake, or it can be frozen. Cut the top and bottom from the pineapple and cut away the peel. Cut the pineapple lengthwise into quarters, and cut oﬀ the core from each section. Cut each piece crosswise into J-inch-thick slices. Beginning at the perimeter of the pan, make an overlapping ring of pineapple slices with the curved side facing out. Make a second ring inside the ﬁrst one, overlapping the slices in the opposite direction, working toward the center of the pan. Reserve any extra pineapple for another use. Sift the ﬂour and baking powder together; set aside. Put the butter and sugar in the bowl of a stand mixer ﬁtted with the paddle and mix on low speed to combine, then beat on medium speed for about 3 minutes, until light and creamy, stopping to scrape down the sides as necessary. Mix in the vanilla. Add the eggs one at a time, beating until the ﬁ rst one is incorporated before adding the second and scraping down the sides as necessary. Beat in the milk. Add the ﬂour mixture in 3 batches, beating just until combined. Pour the batter into the pan and spread over the pineapple. Bake for 15 minutes. Rotate the pan for even browning and bake for another 20 to 25 minutes, until a cake tester or wooden skewer inserted in the center of the cake comes out clean. Cool the cake in the pan on a cooling rack for 20 to 30 minutes.